How you dress up says a lot about your personality and style. It was easier when everybody was supposed to wear formals. However, now that office spaces are encouraging more and more casual environment, examples of inappropriate dressing in office have increased to a greater extent, for many men are just not those into fashion. All they care about is their work; however, various surveys have revealed that how you show up in your office affects your performance too. You might be doing all the work in a timely manner and submitting assignments before deadline but if you haven’t got your dress right, your seniors are bound to see you as naïve and irresponsible, say business psychologists all over the world. Dressing right is equivalent to saying that you have got your life together and is ready to take up the responsibility of a career. Frankly speaking, dressing right is not that much of a task if you follow the basics right. Of course you are all free to play with those guidelines and flaunt your own style but it would be better if you did that after the office hours. As far as work environment is concerned, studies have shown that incorporating a little strictness to your attitude helps perform better at work. So, here are a few things you must keep in mind while getting ready for work. 1 Understand your work environment and dress appropriately. If you are the manager of a company, dress like it. Showing up in a board meeting dressed like a hippie clearly shows sign of irresponsibility and a careless attitude towards work. 2 Comfort matters but make sure that your clothes aren’t too loose or too tight. 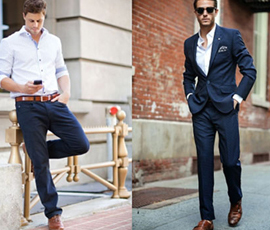 Your clothes, be it a jacket, a vest, a suit or your pants must fit you right enough that it compliments your body. 3 If you happen to be one of those whose eyesight is weak and need to wear glasses, make sure that your glasses are of the right size. Glasses that keep sliding down your nose are a bit distracting. 4 Never show up at work carrying a hiker’s bag because for God’s sake you are not going on a camping trip! It’s your office. Go for a suitcase (if you wear a suit) or a messenger bag (if you work in an office with a casual environment) instead. Even if you wanna go for a backpack, make sure it doesn’t give an impression that you are just coming back from a holiday. 5 Do not wear too much cologne. Moderation is the key. And, just in case you don’t know some people get headaches from strong odors and others might judge you for hiding the fact that you haven’t taken a shower for a week. You don’t want that, do you? 6 Always make sure that your shoes are clean and polished because it is a fact that people tend to unconsciously notice your shoes first when you meet them. Secondly, when you are putting effort into grooming, then, why not do it from head to toe? 8 Last but not the least; choose the color of your dress/suit wisely. Insanely bright, flashy and neon colors are a big no. Always go for rich and dark colors as they represent authority. So, now that you know these fashion secrets to dress better for office, go ahead and impress your boss as well as your colleagues.